Lent is a time when we traditionally slow down and reflect, journeying alongside Jesus as he travels through the wilderness for 40 days. We might take time to pray, to study, to attend extra services, read a spiritual book and join a Lent group. The sermons are more reflective, leading us towards the events of Holy Week, then on Good Friday we remember Christ’s death and of course on Easter Sunday we celebrate his resurrection. Lent starts on Ash Wednesday which is the 5th March this year. What is the spiritual world and how does it impact my life? If you would like to take part but groups aren’t your thing then you can just get a copy of the workbook, which costs £3.99. There is also a book that the course is based on entitled “How can I be Happy?” which costs £7.99. This year our Sunday Lent sermons will be based on a book by Stephen Cottrell entitled “The Nail”. The book offers reflections on Christ’s crucifixion, each chapter focussing on a different character, who describes his or her experience of the Passion. Members of the congregation will be giving their own meditations. If you would like to buy this book it is £6.99. On Fridays at 12 noon at St Mark’s Church there will be a service led by visiting clergy from the other churches in the area. The theme for their sermons will be “God and the World” considering topics such as Climate Change and the impact this has on God’s World. After the service a Lent Lunch will be provided, the proceeds being given to charity. Posies will be given to all the mothers in the congregation. Holy Week Starts on 14th April and there will be Communion Services in one of the churches each day – look out for details in next month’s magazine. 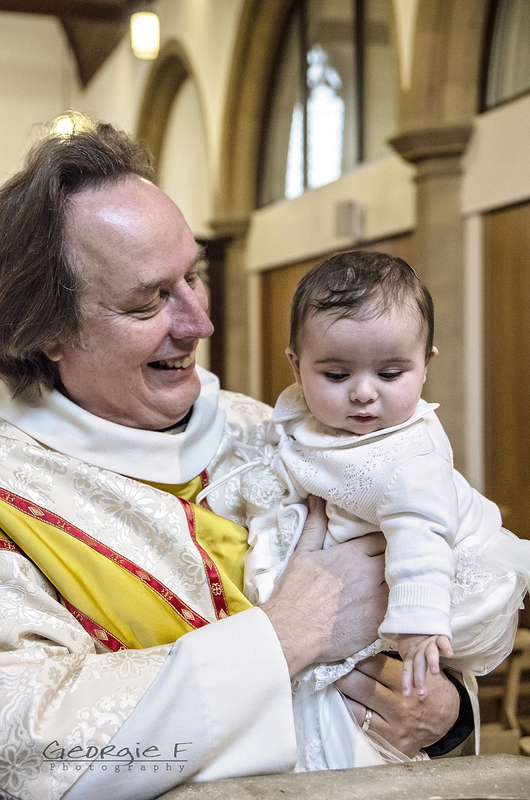 Florence was baptised on Sunday and was the first person in our Parish to be baptised using the trial baptism liturgy. We felt it was a big improvement over the old one. Members of St George’s congregation said it was a much more accessible service, and shorter, and it was good not to mention the devil! Alan felt it was just as challenging as the previous service but in a way which was much more understandable to the parents and godparents. Florence seemed to enjoy it too but made no comments about the liturgy! As part of my course, I have been asking people about their experience of prayer and have been surprised at the variety of response. Of course, I shouldn’t have been surprised because there is no one right way. God has made each of us unique, the fun comes as we try to discover what works for us. Does prayer come easily to you? Have you ever been climbing a sheer rock face, knowing that your climbing partner is relying on your skill to lead the way, knowing that if you fall off, whilst you might be safely dangling at the end of your rope, there is always the chance you might tumble to the ground? I was pleased to find that prayer came very easily to even the most agnostic of my interviewees given those circumstances. Does prayer in church do it for you? Sadly it seems that my respondents didn’t really get a lot out of formal prayer in church, although in fairness one said it depended on her mood. Sometimes she wished people didn’t dawdle through the service, but she had her favourites who set the right pace for her. Another said that the formality was part of the problem, it didn’t leave enough space for him to reflect, he’s more of an ad lib man. Hum … there’s no pleasing everyone it seems. However, they were all quite clear that other people are a great influence in their prayer lives, but even this isn’t as straightforward as I first thought. There was the influence of a kindly man giving a prayer poem to someone when she was seven. She told me that this prayer has stayed with her all her life. On the other hand, another told me about his experience of wondering why he had to go to Sunday School put his hands together and close his eyes and be told all about the missionaries in Africa. He was totally put off by these self-righteous folk when all he wanted to do was go out and play on a Sunday. Thank goodness things have changed in the sixty or so years since he went to Sunday School! So what is prayer? One old lady told me that she doesn’t like to bother God after all this time when there are so many other more important things which need His attention. So she goes out into the garden and has a conversation with her husband who passed away over 30 years ago. Between them, they work things out as they always used to. I think that probably is prayer, or at least it is no less a prayer than the one the climber sends out into the abyss as he wonders how he’s going to get up the rock face. 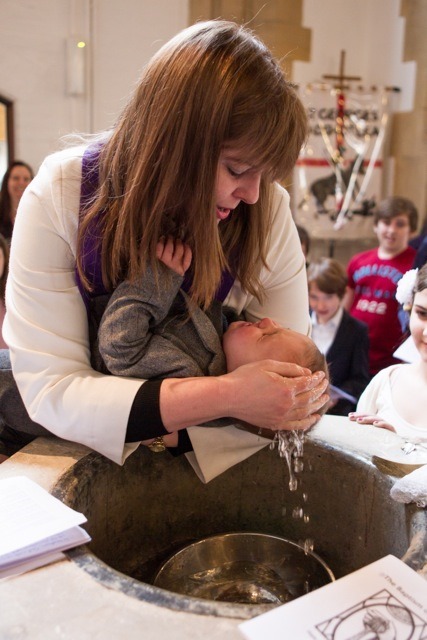 In 2011, the General Synod of the Church of England requested that the baptism service should be made available in more accessible language. It was felt that many people who do not attend church regularly feel disconnected and mystified by the language of the service. In particular “The Decision” does not help friends and family understand and engage with the intention of those responsible for supporting the newly baptised. Also, the “Prayer over the Water” feels more like a theological treatise than a prayer. Hence, a new trial liturgy has been written and the Parish of Hale with Badshot Lea along with 400 other Parishes around the country have been asked to use it and feed back whether any changes need to be made. Please help us do this by giving your opinion. The services were on 12th January at St Georges, the 26th January at St Mark’s and will be on the 23rd February also at St Mark’s. Please give Lesley or Alan your feedback. Below are comparisons of the Tradition Form and Trial Form of the liturgy for two sections – “The Decision” and the “Prayer over the Water”. Alan and I are really excited about the new liturgy because when comparing it to the old one it is using a language that people will understand, it is shorter, less wordy and less preachy, and relates more to the exciting journey of faith and to the God of Love.